Loreto, situated along and in the Sea of Cortez on the eastern coast of Mexico’s Baja peninsula overlooking Danzante Island, is a 90-minute flight from Los Angeles. The month of May certainly sends a disproportionate share of margaritas and mole sauce across the tables of El Azteco, Cancun Grill, Los Tres Amigos, Fiesta Charra, Pablos, La Seniorita, and other Mexican restaurants across Mid-Michigan. Consider the weekend fiesta an appetizer for the authentic cuisine and culture coming up on a trip to “Mexican Fest Chef Week” May 15 -20 at Villa del Palmar Resort & Spa at the Islands of Loreto. Bravo television “Top Chef” Betty Fraser; Food Network’s Kevin Des Chenes; and Chef David Fuerte will display their appreciation for the Mexican culinary scene – which thrives off the abundant seafood and local produce – via five-course dinners, cooking displays and barbeque buffets at the 4,447-acre beach and mountain resort. Loreto, situated along and in the Sea of Cortez on the eastern coast of Mexico’s Baja peninsula overlooking Danzante Island, is a 90-minute flight from Los Angeles. 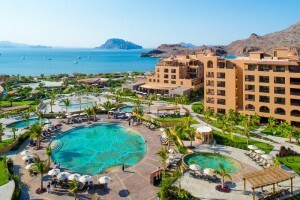 While it’s a flight path less-traveled, the as-yet virtually “undiscovered” Villa del Palmar at the Islands of Loreto, with 181 new rooms, is the first and only luxury resort and timeshare program on the virgin beaches there. Though modern, the properties style blends beautifully into the mountainous, natural terrain where the town, which hit the map with a mission in 1697, lies. The fiesta is not all about food. The resort has made a splash with five swimming pools, fishing, scuba, snorkeling, kayaking, dolphin and whale watching and island tours on inflatable boats over the indigo waters of the Sea of Cortez at a World Heritage site with 900 species of fish. For land-lubbers, Villa del Palmar has a footprint of salsa dance lessons, mountain biking, tennis, a spa, and a new golf course. The photos emerging from the Rees Jones-designed TPC Danzante Bay are show-stopping shots of a seaside golf course winding through canyons, over mountains and around lakes. The bar for that type of cliff top adventure golf on Mexico’s Baja Peninsula was raised a few years ago by Quivira Golf Club, the course Jack Nicklaus created near Land’s End 10 miles from Cabo San Lucas at the Pueblo Bonito Resort communities. Golf Digest recently named the newcomer as one of the “World’s 100 Greatest Golf Courses.” So scenic is the course it needs three “halfway houses” with pina coladas and panoramic vistas for photos.